The unveiling of a painting at the World Intellectual Property Organisation (WIPO) in Geneva in honour of former Foreign Minister Lakshman Kadirgamar was reported in the media last week. It meant, on the one hand, that the renowned leader has not been forgotten, and on the other, the painting is a recognition of one of our most talented painters, Stanley Kirinde. Both gentlemen are no more – Minister Kadirgamar died in August 2005 and Stanley K in February 2009. 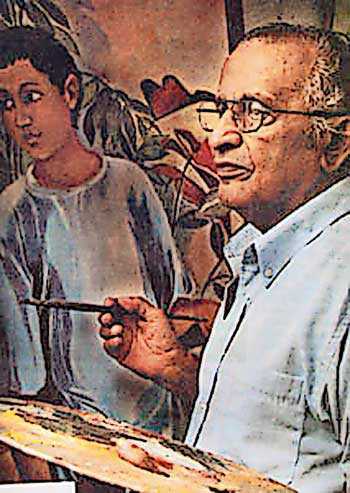 Not much, if at all, had been heard about Stanley K since his death although he was acknowledged as one of the ‘Classical Painters’ that Sri Lanka produced. I remember the last of his exhibitions I attended in May 1999 at the Art Gallery. I treasure the well-illustrated book, ‘A Classical Vision’ picked up at the exhibition which he autographed and gave me – an old friend from the Peradeniya campus days in the early 1950s. He was at Arunachalam Hall and I was the hall opposite, Jayatilaka Hall. We used to meet often. Having done a History Honours degree he joined the public sector and served in several parts of the country before coming down to Colombo where he spent several years at the Ministry of Defence. He retired in 1991. In between we met occasionally. 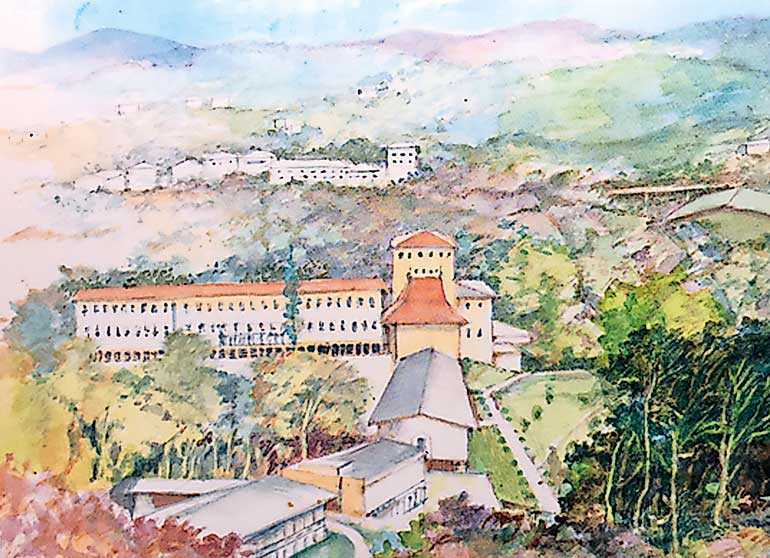 His contribution to ‘Peradeniya: Memories of a University’ in the form of four paintings of the university brings back sweet memories of the good old days. It was a timely effort by Dr Sinharaja Tammita-Delgoda and Kapila Ariyananda in producing ‘A Classical Vision’ – an elegant publication with interesting articles and a fine selection of Stanley K’s paintings. I can’t remember of any other publication about him. Hailing from Deegala in the Dumbara Valley, he started painting as a student at Trinity College where he was inspired by the drawings of the great artists on the walls of the art rooms. 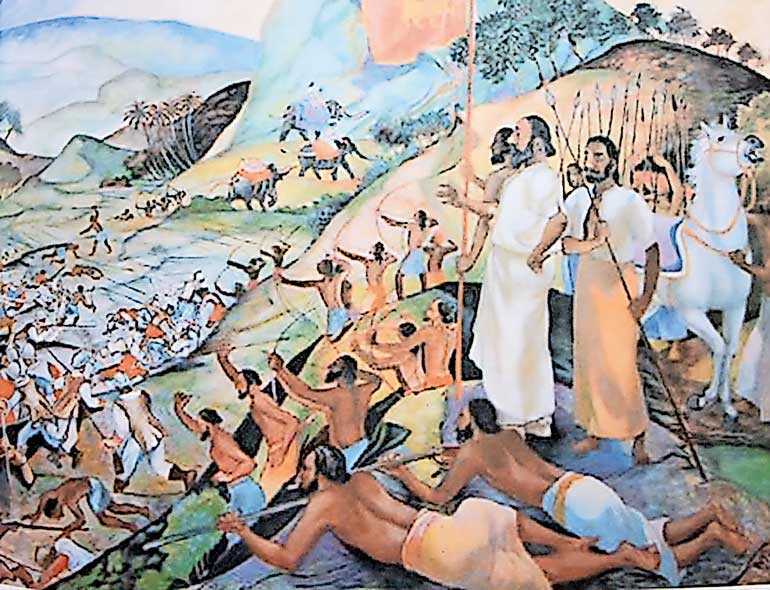 The narrative on Stanley K describes how the frescoes of the Tivanka Pilimage in Polonnaruwa made a deep impression on him. 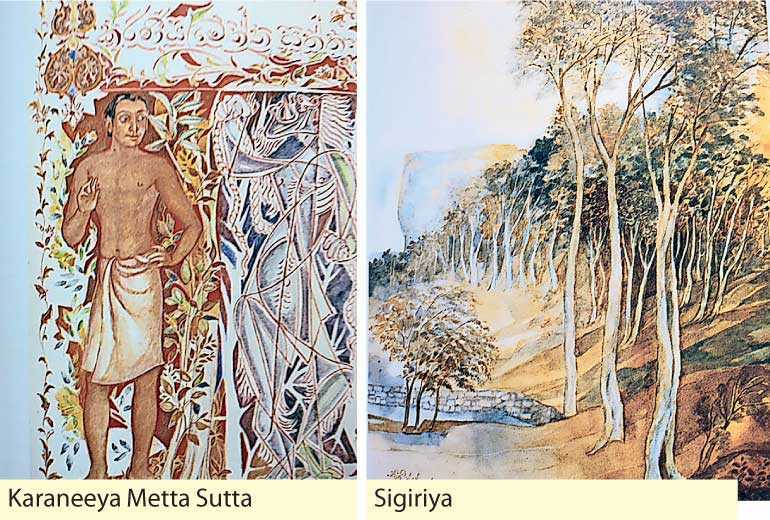 In a separate chapter in the book, Kirinde discusses his thoughts on Sigiriya frescoes, which to him are “amongst the finest and purest examples of Sinhalese art”. Every maiden seemed so intensely feminine yet very distinctly individual. He wondered at the exquisite drawing of the face and the hands, noting at the same time the very correct and almost professional quality of the draughtsmanship. Clearly the result of very careful observation and study, it was the nearest thing to perfection that had come across in Sinhala painting. Kirinde saw Sigiriya as a pinnacle in Sri Lanka’s artistic achievement, “as amazing as anything you have ever seen”. Kirinde had a short stint at the Peradeniya University as assistant registrar (1969-71) during which time he was commissioned to paint a portrait of Sir Nicholas Attygalle, Vice Chancellor 1955-66, which hangs in the University Senate building. A portrait of the distinguished University librarian, Ian Gunatilleke done in 1996 hangs in the University Library. At least these help to remember that he was an ‘old boy’ of Peradeniya. His work was exhibited both locally and globally. President J.R. Jayewardene commissioned him to do black and white engravings depicting the audiences given by two Kings of Kandy to Dutch admirals. These were hung in the President’s House. He was also commissioned by armed forces and several government institutions to do paintings for their offices on relevant themes. Some of the paintings done for the Foreign Ministry were gifted to institutions abroad. Among them were the portraits of Dr. Gamini Corea (given to UNCTAD) and Ananda K. Coomaraswamy for the Boston Museum of Fine Arts. While he is best known for landscapes, Renuka Sadanandan, in an article in the Sunday Times titled ‘Kirinde’s moments in history’ refers to the passion he had for historical subjects – possibly because of what he studied for his degree. Once he depicted the visit of four ambassadors from our country to the court of Augustus Caesar. The battle of Danture when the Kandyan king Wimaladharmasuriya I (1591-1604) routed the Portuguese general Lopez de Souza at 1594, Keppetipola overcoming a British battalion (a mosaic using remnants from Piliyandala Ceramics Corporation factory), and the defeat of the king of Kalinga by the King of Kotali were among the best known of his creations.